Discovery occupies the larger of the two buildings – 8,300 square metres, against the other, an inverse, near-repeat design of 8,000 square metres. Discovery, committing to the project early on, relocated their regional office from Century Boulevard in mid-2018. Of the adjacent 8,000 square metres, MTN will also be relocating their regional office from elsewhere in Century City, taking up just under 4,000 square metres across the ground and first floors. The second and third floors have been committed to ICLEI, Byte Orbit, Sasfin and TAL. Situated on the prime gateway to the south of Century City’s Bridgeways green zone, with iconic views of Table Mountain and the city, Sable Park’s futuristic design and position, combined with first-class amenities, was seen as the desired location for these businesses. Century Square, which houses restaurants, delis, Century City Hotel and Century City Conference Centre in a superbly designed setting, creates convenience and sophistication. A few hundred metres from Sable Park, Virgin Active offers a daily workout in addition to the landscaped walkways and canals throughout Century City, providing an opportunity to exercise safely within the secure precinct. Sable Park’s location encourages the use of public transport to cut carbon emissions: bus, MyCiTi bus and minibus taxi routes leave from a public transport hub less than 500m away, and Century City station is a mere 10 minutes’ walk away. Designed by dhk Architects to optimise natural lighting, each building has two wings off a central core and a light-filled quadruple-volume atrium, spanned by a series of bridges at the edge of the main core. Water for ablutions, air conditioning, cooling systems and landscaping is drawn from the Potsdam municipal sewer treatment facility, and is then treated to safe levels. In much the same way as the design of the building, landscaping has played a crucial role in the development of Sable Park, with each building appearing to be embedded in a green platform. A series of terraces on all four sides of both buildings works as outdoor lounges. Building on the success of Sable Park and its surrounding commercial office buildings, Rabie have appointed WBHO who have commenced with the earthworks for the construction of another state-of-the-art commercial building, Sable Corner, which is just across the road. 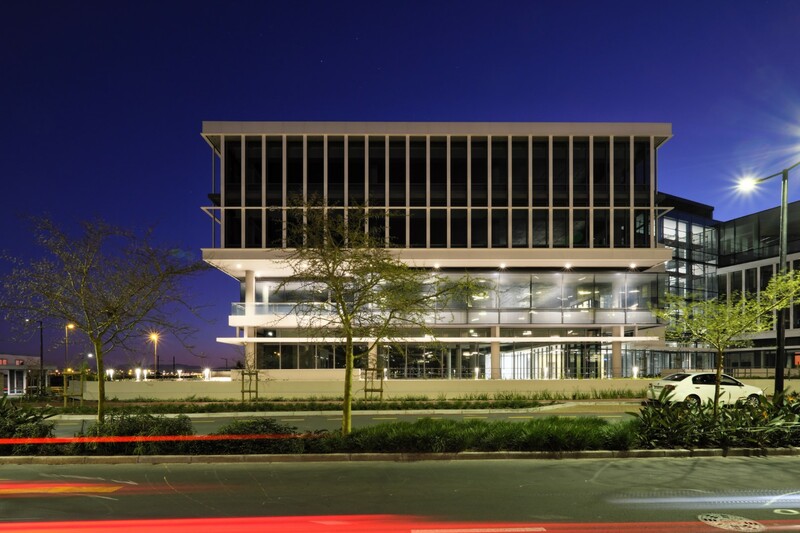 With a gross lettable area measuring approximately 7,000 square metres of premium-grade office space, Sable Corner is set for completion in the first half of 2020.